We’ll be having our wedding in a public park. It’s a nicer park in a more well-to-do (read: expensive) town, so it’s pretty costly for a public space. 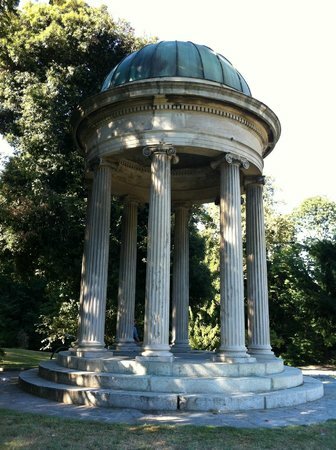 The ceremony location is a tempietto which looks kind of like this but is on a pond. I have no idea if we’re going to do any amount of decoration for the wedding. The caterer is going to be bringing linens for the tables. Maybe we’ll get some used chalkboards to indicate where the wedding is? Otherwise, I’m at a loss what sort of decoration we really need. If it wasn’t clear already, wedding planning is not my forte or interest. Thankfully Fiancé has been picking up my slack here. We’ve decided to go to with a Chinese-American woman-owned restaurant to cater our wedding. I came across this place as a food truck that sells near my work and I love everything they make. Fiancé and I had a tasting to make sure the menu was accessible to his family. No fermented black bean dishes, for instance, even though we both love the taste. Strangely enough, none of the Asian side of my family is likely to come– maybe my dad, except he’s having visa issues– but I know that my guests can generally deal with “weird” food. Fiancé’s mom has graciously offered to pay for the wedding’s catering. This includes set up, tear down costs, silverware, etc. That just leaves fiancé and I to deal with the cake. We probably won’t go with anything custom, but rather get two half-sheet tortes (right now we’re thinking chocolate sacher torte and princess torte) which look presentable but can be served directly to guests without fanfare. We’re using our engagement rings as our wedding rings. Fiancé has offered to make our clothes for the day, which is a big project. I’m a little worried he may be biting off more than he can chew. He’s made formal wear and has a lot of costuming experience generally, but it is a ton of work. So while the plan right now is that he’ll make our garments, I’m ready to pull the trigger on pre-made garments if need be. That said, we’ve already picked out patterns for the clothes we want and have already bought the fabrics. In terms of styling, I still don’t know if I even want to do any styling for the wedding. Like, I’ll get a haircut a week out that’s suitable, but otherwise I plan to wear that down and normal. I never wear makeup in my daily life (sensitive skin) so I might want to skip that too. Is that a terrible idea? Fiancé knows that he wants to his usual hair stylist to prep his locks on the day of the wedding. His stylist has already agreed but also recently announced that he’s moving to Chicago. He noted that he plans to come back into town for the fall season since a lot of his clients are getting married then, but we should probably start looking for Plan B’s in case that falls through. I know it’s probably gauche to rely on the labor of friends for a wedding, but in our defense there are some things we really prefer our friends be involved with. For instance, officiating. Both fiancé and I come from mixed-religion families but neither of us are particularly religious. The things we value most are a sense of community and love toward one another. So we though it’d be nice if one of our friends officiated. I don’t know if this is a common thing everywhere, but it certainly is something many of my friends have considered or done for their own ceremonies. We felt it would be lovely if one of his friends in particular, who would have been his best man if we had a wedding party and is the picture-perfect definition of a Lawful Good alignment, would do us the honor. He’s accepted which is thrilling for us, but I want to make sure we give him some material to work with (without being overbearing) so he doesn’t have to work from scratch and we overburden his kindness. Similarly, another one of his friends is a hobbyist photographer who is amazingly good. It was her wonderful and whimsical photographs, posted onto Fiancé’s online dating profile, that piqued my interest in Fiancé in the first place. We asked if she would be willing to photograph our wedding and whether she had a going rate. While she seemed thoroughly excited for us and graciously offered to help us for free (and some wedding food), we don’t really feel comfortable with that arrangement. Photography is a lot of work so at the very least, we want to give her a token $250 or so to show our appreciation. I still feel a bit guilty we’re being cheap here. I don’t know, thoughts? Lastly on the labor list, we still have to figure out whether we should get a day-of coordinator or an attendant (i.e. someone who can help clean the park bathrooms). It would help relieve some of the stresses on the big day, but then of course there’s always the consideration of money. We were planning on Fiancé’s violin instructor, who is just a stunning musician, play at our ceremony. However she recently got accepted to a big-name conservatory in New York so she will be moving before our wedding. She’s promised to help find someone that can play– there’s a very good conservatory here and lots of musicians floating around. But we probably should be prepared if this falls through. For the reception, Fiancé will be preparing a playlist for dancing / easy listening purposes. He thoroughly enjoys setting the soundtrack for performance events so this is right up his alley. He’s also mentioned that he’s been secretly putting together this playlist (for a hypothetical wedding) in his head pretty much his entire life. So, we’ll be taking the low-key route on that item. We used Paperless Post for our invitations. The only stationery we’ll theoretically need on top of that is for thank you notes. Do we have to write thank you notes if we tell people not to bring gifts and to donate to charity instead? I’m really lazy. Also, I have never personally valued correspondence I’ve received as mere formality, though I understand this sentiment isn’t shared by all (most?). The appeal of flowers is lost on me. I remember one time I was at a quiz bowl tournament in high school. Each table had a pot of daisies in the center. Bored out of my mind at listening to introductory speeches, I started picking at and then eating the daisies. Which led to the rest of our team looking at me very strangely and then after a few minutes also picking at and eating the daisies with me. So yeah, flowers. Food, friend, foe, decorative purpose? I don’t know. I imagine we might get a brooch for him and I guess flowers for the tables maybe? Or maybe not, because they are insanely expensive? Still on the fence here. Around the same time as the wedding, either a couple weekends before or after, we’d like to have a second reception for all our local friends and acquaintances who we couldn’t invite to the wedding itself (since we’re trying to keep it small). Our thought is to have this after-party at a local roller skating rink and pay for folks’ shoe rentals and greasy rink food. Here’s the total cost of everything for our wedding, along with our previous budget. How much did you or would you spend on your wedding? Would you ask a friend to help “work” your wedding? Are written thank you notes important? What’s the appeal of flowers? Any other tips? I would definitely ask friends and family to help work the wedding in lieu of the gift. (Except I would also want to pay for any extra materials needed, such as printing photographs.) In fact, I kind of fantasize about involving all of my guests, making sure to pick things they would actually enjoy doing. I think whether written thank you notes are important depends on your family and friends. If they are cool with informality, I would still at least e-mail a thank-you. I would enjoy sending fancy thank-you cards, so I haven’t thought about this issue much. Um, flowers are pretty? And then the bride has something to do with her hands and then something to throw at single guests? You’ll be outside with plenty of lovely plants all around, so I wouldn’t worry. My main tip is that people really want to express their love by giving gifts. Even my aunt and uncle, who were trying to merge their two full houses into one and thus begged for no gifts, got so many gifts. (I tried to at least talk people into small gifts instead of big ones.) Charity is a good idea, but I think might not be fun enough for them. So my tip is to make a list of things you might actually want, even though you don’t need them and maybe already have a perfectly adequate version. Then if somebody realizes one of your guests is intent on getting you something, they can at least point them to this list and so it will reduce the wastefulness. And put things of different values on the list, from kitchen towels to sheets or fancy blenders (or whatever), if possible, so your rich relative can get you something super fancy if they want to and other stubborn people can also contribute to your new lives in some useful, but affordable, way. Oh man, I didn’t think about what I’d do with my hands. I fidget so much. I’d hate to throw my bouquet into the crowd only to find I’d mindlessly plucked it petal-less. Hmmm. Good idea with the gift list! I’m such an anti-stuff person, but this is something I need to be less militant about, especially with Fiance’s more gift-oriented family. I can only comment on some of these issues from the perspective of a guest, but I’ve been to quite a few weddings now, maybe two or three with minimal flowers (bouquets for bride and bridesmaids, small or no centerpieces for tables, minimal other flower decorations), two with what seemed to be pricey/large quantities of flowers (bigger bouquets for bride and bridesmaids, bigger centerpieces, more flowers as decoration everywhere and in more colorful/varied arrangements) and one with no flowers at all (a family member made cool paper flowers out of book pages for the bride’s and bridesmaids’ bouquet) and… Based on that, I might totally opt to not have flowers or to have minimal flowers. I don’t think one really notices the presence or lack of flowers in most of the photos (even the larger arrangements for decoration at the “pricey flowers” weddings don’t stand out that much in photos that show more of the venue). Best wishes for the upcoming wedding! Thank you! It’s good to hear flowers are less important from a decorative standpoint. One less thing to worry about. We basically had your wedding except I bought a prom dress and DH rented a suit. And we had bbq catering instead of Chinese. (And after my MIL *changed the date of the wedding* because of a high school extracurricular that DH’s brother ended up not being allowed to go on anyway because he got caught with his girlfriend on another school trip yes I’m still bitter 18 years later we couldn’t have it in the public park I’d booked and ended up doing it at a Lutheran summer camp area instead, though neither of us are Lutheran.) We had a minister and an Episcopal ceremony, but I do really like it when friends officiate instead and when people do their own vows and unity candles and stuff. But I am lazy and was quite happy with the shortest, least sexist ceremony in the Book of Common Prayer. All the other things you say I must agree with because that’s what we did, EXCEPT, you need to write thank you notes. I did them the night of the wedding since we weren’t leaving for the honeymoon until the next morning. People like knowing you got their gift. OMG, you have every right to be bitter. We scheduled our wedding around Fiance’s aunt’s annual quilting conference, but there’s no way in hell we’d ever reschedule it or be okay with someone else doing it for us. There are aspects of religious ceremonies I might like but it would both be a hassle to plan and feel like we’d be picking one religion over the others and piss off 75% of our attending family members. Sooooooooo, avoiding that. Ugh, vows. I am so bad at public proclamations of sentimentality (if I reveal my soft underbelly, it’s basically an invitation to be slain on the spot), but Fiancé wants us to write our own and it’s a sweet sentiment and I’m sure I’ll be glad we did it after the fact. DH did his family’s thank you notes, but most of those were after the second reception downstate. I still have too much PTSD from family drama and stress around my own wedding and you’re having a very different wedding than we did, so I’m not going to say much other than to +1 everyone else on the thank you notes and Debbie M’s last paragraph on the gifts. People will get you gifts. Even if you ask for no gifts. Asking for no gifts just helps people who can’t afford to buy you a gift to feel okay about it. Weddings we’ve been to with no registry got cash/checks and random gifts. We got about half cash, half physical gifts. We thankfully got nothing off registry. My parent said that we had too small of a registry, but we only asked for things we really wanted. We got fancy steak knives, more fancy knives, a 10” frying pan (a size we were missing), some fancy cocktail and beer glasses, a wok, a hand mixer, a tripod for our camera, some attachments for our KitchenAid mixer, a couple cookbooks, a small Bluetooth speaker, and some fancy kitchen scissors. Thank you notes are so, so, so important as a wedding guest. If I travel (even an hour of the city), give you a Saturday or Sunday night of my weekend, and give you a $200 gift, I want to know that you a) got the gift (which yes could be accomplished with a text) and b) appreciated it. Weddings are just a thing where you should definitely write thank you notes. It’s the polite thing to do. I still remember every wedding that never sent me a thank you note. We went all out on ours – we did photo of us on the front thank you cards from Minted, wrote the note in nice pens, and included hard copies of any pictures of them our photographer took. People loved them! (You don’t have to go that far though.) We had about 50 thank you cards to write and we did them after the honeymoon. My husband was responsible for any to his family and his close friends. We started out trying to do one a day and we ended up finishing them all in about a month. We paid for no flowers. Our venue included table flowers! Which was perfect! They were nice table centerpieces. My MOH brought me a fake flower bouquet she had from something else and it was great! I did find it awkward in photos because I kept trying to hold it too high lol but it was a lovely touch. We did not do a bouquet toss. I think they are insanely anti-feminist and ridiculous. No one other than my parent was surprised we did not do one. One of my favorite things about being married is not being expected to participate in bouquet tosses, that is how much I hate them! Also, I hope you have a lovely and fun wedding and that the planning stress doesn’t get too bad!!! It really was an incredible weekend. I really worry if we put together a registry, folks will completely ignore our donations plea (and I’d muuuuch rather our fave charities get the money than to acquire junk, ugh). But yeah, I recognize a lot of folks really latch onto physical gifts, so we need to figure out what kind of things we would be okay with receiving. And yeah, thank you notes. Gah. We’ve already put up charity pledge stuff on our wedding website, so hopefully people will stick to it… Some of them are more politically charged in ways that our more conservative family members may not like, but we threw a food pantry in there and c’mon, who can object to that? My daughter was stationed in Hawaii for the Navy. She was married in a free tropical forest, by her free bishop (Bishops in the LDS church are not allowed to charge for their services). She bought her knee length white dress off the rack for $30. Her husband wore a suit he already had. A friend provided everyone (about 9 or 10 folks) with Leis. Another friend drove them. Another friend spring for Thai food, picnic style, and from a food truck, I think, as a wedding gift. Her bride maids (fellow members of the navy, wore dresses they already had. For a wedding in Hawaii, it was definitely budget, and cost less than $200. Now, her reception was held in Salt Lake, where the groom was born. The reception place was free (one of the sisters lived in the housing development which had a room for parties), and all his sisters got together and hired a caterer, and decorated it themselves. There was no band. I (and her father) had to travel 2000 miles to get there, but it was worth it. Definitely laid back and low budget. Excuse typos…I did not proofread…oops! That sounds like a very sweet and intimate wedding! I don’t think it’s horrible to ask your friends to contribute to certain special aspects of the wedding. I asked my best friend to officiate and he also helped with some of the photos. My cousin and a few dear friends helped with some of the decor, it was a bit of bonding time before the wedding madness. I AM still bitter about family who insisted on bringing their highly contagious sick kids visiting instead of staying home because they got me incredibly sick. That the day of our reception was me drugged to the gills and not really knowing WTF was going on. I didn’t enjoy a minute of the day after all that work and money. Stupid selfishness. Fiancé has been really good about taking on the bulk of the work for planning the wedding. It makes me very happy not worrying too much about it. Oh no! I’m so sorry you were sick during your reception. That majorly blows. *shakes fists at the selfishness of relatives* We just had our first “no parents we are not doing that” conversation last weekend and it went pretty well so I am hopeful we can get around the drama. Yay, setting boundaries that hopefully people will respect!